I visited South India in December 2007 for the third time. Like the visits before it wasn’t only a birding trip. With my wife I also visited friends and enjoyed South Indian culture. However 5 days in Kerala were pure birding and I also made some trips around Pondicherry (our base) and to Vedanthangal Bird Sanctuary and Pulicat Lake. I recorded a total of 248 species of which 58 were new for me. During the five days with my guide Eldhose we saw most of the South Indian endemics and a good range of mammals, including the endangered Nilgiri Thar. I arrived in the morning at Cochin Airport and met my driver Babu. We arrived at Hornbill Camp in time for a nice lunch and some time to rest. In the afternoon I met Eldhose, my guide at the entrance of the Thattekad (or Thattakad) Bird Sanctuary. First we explored the sanctuary. Just after the entrance Eldhose showed me a roosting Brown Hawk Owl. The first endemic I spotted was a Malabar Parakeet, followed by two Malabar Grey Hornbills. We also found a male Blue-throated Flycatcher, a Black Baza and a Sri Lanka Frogmouth, sitting motionless in a bush. A flock of White-bellied Treepies passed through noisily. South of the river we followed the track to Eldhose’s house, where we could observe a pair of Red Spurfowls. Two roosting Mottled Wood Owls were harrassed by some Chestnut-tailed Starlings of the South Indian subspecies blythii. Finally we spent some time around the radar of the Cochin Airport. We saw a Streak-throated Woodpecker and heard an Indian Pitta and a Collared Scops Owl. In the morning we drove to a forest area above Kotampuzha. The ride on the bad track was rewarded with some wonderful, pristine forest. Here we recorded Grey Junglefowl, White-bellied Woodpecker, Heart-spotted Woodpecker, Crimson-fronted Barbet, Vernal Hanging Parakeet, Indian Swiftlet, Besra, Small and Scarlet Minivet, White-bellied Blue Flycatcher, Hill Myna, Puff-throated Babbler, Dark-fronted Babbler, Crimson-backed Sunbird and Little Spiderhunter. Giant Squirrel and some Leaches were also noticed, the latter without much enthusiasm. Before Lunch we found Grey-headed and Yellow-browed Bulbul near the sanctuary. In the afternoon we paid a second visit to the sanctuary itself. With some effort we found Malabar Trogon, Crested Goshawk and a Blue-faced Malkoha. A Speckled Piculet came as a surprise as it is usually not recored in the sanctuary. As we heard Elephants approaching we had to return. South of the bridge we explored the area around the radar once more, finding a Jungle Owlet of the rufous southern form. Near the river we managed to attract an Indian Pitta and finally we heard and saw a flying Jerdon’s Nightjar. Today we made a longer drive to the Idamalayar Project Area. This area is closed but obviously Eldhose is allowed to enter. With a short stop for Plum-headed Parakeets we drove to the Idamalayar dam (also called Edamalayar). Here we noticed Dusky Crag Martins, Indian Swiftlets and White-rumped Swifts. We joined a truck, which brought us up to some good forest. After some time Eldhose heard the call of Indian Scimitar Babbler. 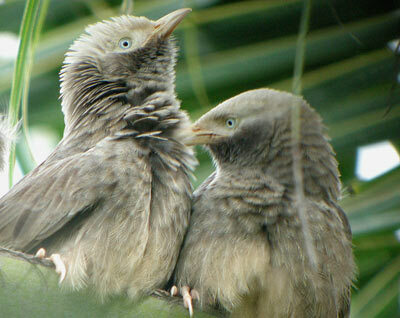 We found them and they were together with a group of Wynaad Laughingthrushes! Other birds were Mountain Imperial Pigeon, Rusty-tailed Flycatcher, Velvet-fronted Nuthatch and Brown-capped Pygmy Woodpecker. In the afternoon we birded around the airport radar, finding a White-browed Bulbul (rare here) and a Rufous Woodpecker. We passed the sanctuary with the car and walked through some rubber tree plantations to the forest. On a small hill we saw a White-bellied Woodpecker, a Green Imperial Pigeon and a very nice Brown-cheeked Fulvetta. Later we drove past the Hornbill Camp up the river. Just after a Forest Departement checkpost we went a bit uphill and waited for Nightjars. Our patience was rewarded with some good views of a Jerdon’s Nightjar and a Grey Nightjar. 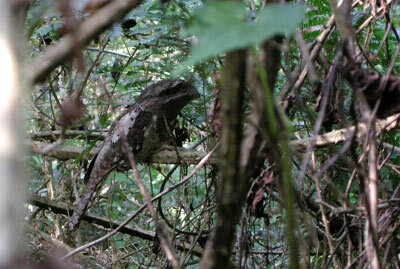 Additionally we heard a Great Eared Nightjar. In the morning we drove to Munnar which we reached in 2,5 hours. Just before Munnar we saw two Rufous Babblers at the roadside. We did some birding at the Cardamom Estate Shola. After some minutes we saw our first Grey-breasted Laughingthrush and some time later Eldhose spotted a Nilgiri Wood Pigeon! We drove onwards to the Olive Brook Hotel where a Malabar Whistling Thrush was sitting outside, singing beautifully. Later we took the road in direction of Rajamalai (Eravikulam National Park). Just after Munnar we saw Black Bulbuls and Nilgiri Flycatchers. We stayed for some hours in a small Shola. 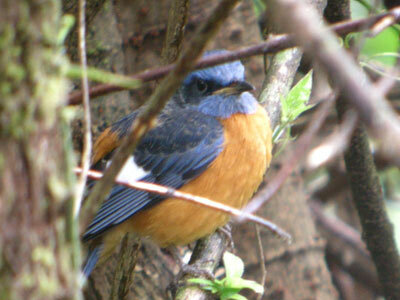 Easily seen were Blue-capped Rock Thrush, Indian Scimitar Babbler and Tytler’s Leaf Warbler. Finally we managed to get a sight of a White-bellied Shortwing and a very brief view of a Black-and-Orange Flycatcher. The dinner at Olive Brooks was excellent. After Breakfast we drove up to Eravikulam National Park. We arrived in time before 8 o’clock to be the firsts in the queue. From the entrance at the 5th mile we took the bus and walked up under the Anamudi, the highest mountain in South India. Grey-breasted Laughingthrushes and Nilgiri Flycatchers were easy to see. After some time we spotted our target: 2 Nilgiri Pipits at close distance. A Nilgiri Tahr far away was a nice additon to the mammal list. We went back down and started our drive to Bodi Ghat. At the Sterling Hotel we changed our car (from Ambassador to Jeep) and noticed some Pacific Swallows. We drove through thick fog over the pass into Tamil Nadu and down the scary hairpin bends. We started our search for the Yellow-throated Bulbul. We saw a Black Eagle, a Blue-winged Leafbird, many White-browed Bulbuls (their song is very similar to the Yellow-throated), a Hume’s Warbler, a Thick-billed Flowerpecker but no Yellow-throated Bulbul. In the end Eldhose was pretty sure that he heard one, but we failed to see it. Unfortunately we had to go back and after a rough jeep ride and a long (but comfortable) drive in Babu’s Ambassador it was time to say goodbye to the best guide I ever had. I arrived in time at Cochin Airport and took the flight back to Chennai. Lake Ousteri is an old artifical lake west of Pondicherry. I spent the morning at the Lake Garden of the Sri Aurobindo Ashram. I did some digiscoping and a Grey-bellied Cuckoo, a Black-headed Cuckooshrike and a lonely Spot-billed Pelican were nice additons to the list. With a taxi I drove north along the East Coast Road. Some marshes near Kaliveli Tank and a great saltlagoon at the Yeduyanthittu Estuary harboured ducks and waders. Some Pacific Golden Plover and a Lesser Sand Plover were the highlights among the waders. A Caspian Tern and four Great Crested Terns were a nice sight too. With some friends from Pondicherry I visited Lake Ousteri again. First we spotted a lonely Rosy Starling then a Purple Swamphen. A wintering Osprey was a nice surprise. Early in the morning I left Chennai, heading for Pulicat Lake in Andhra Pradesh (Taxi including permit for Andhra about 2300 RS). From Sullurpet we took the road to Sriharikota Island. Shortly after Sullurpet we entered birder’s paradise. A large area of swamp and mudflats, holding thousands of birds. Ducks and waders were absolutely abundant. First I stopped at a marsh to the left where I found Grey-headed Lapwings two years ago. However I had no luck this time. At a drier site I found a mixed flock of Ashy-crowned Finch-larks and Greater Short-toed Larks of the eastern race dukhunensis. Two Jerdon’s Bushlarks also appeared, so did a young male Pallid Harrier and a Pied Cuckoo. After some stopps for terns I scanned a huge flock of Flamingos near Shriharikota. Among the thousand or so Greater Flamingos I found 4 Lesser Flamingos. At the information centre I took the track south to the island of Venadu. Marsh Sandpipers were common and among the thousands of Little Stints I found a Curlew Sandpiper. Some Lesser Sand Plovers, two Greater Sand Plovers and some Pacific Golden Plovers were present too. The island itself is much drier. A White-eyed Buzzard surveyed the area and so did a pair of Montagu’s Harriers. With a day list of 90 species, including 22 Waders I return to Chennai. Today I left at 5.30 am with a taxi to Vedanthangal Bird Sanctuary. We arrived after seven to find the landscape in thick fog. The fog lifted quickly and I did some birding on the road to the sanctuary. There wasn’t much activity but two perching Red-necked Falcons were a very good sight as they are pretty rare in Tamil Nadu. On the spot where I’ve seen Indian Coursers two years ago some workers were building something. A Grey Francolin and a White-eyed Buzzard were the only birds to notice here. The Sanctuary itself was filled with water. After paying the entrance fee (5Rs, 10 for parking, 25 for the camera) I went up to the dam. The sound background was fantastic. Thousands of birds were breeding in the heronry: Painted Storks, Openbills, Spot-billed Pelicans, Spoonbills, Grey Herons, Black-crowned Night-Herons, Intermediate Egrets, Little Egrets, Cattle Egrets and Little Cormorants. In a big bamboo some Flying Foxes were sleeping. My trip to Kerala was organised by Thomas Zacharias from Kalypso Adventures in Kerala. He was very helpful and I was very satisfied. In Thattekad I stayed at the Hornbill Camp where food and view were excellent. The Olive Brooks in Munnar also provided outstanding food. My guide Eldhose was an incredible good birder, I can highly recommend him. 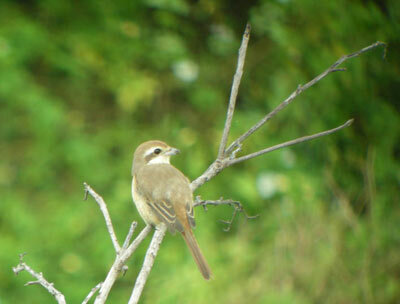 In Pondy I enjoyed birding with Dilip Patel and Atma. Kiran let me generously birding at the Lake Estate of the Sri Aurobindo Ashram. In Chennai we stayed with our friend Mahendra. I thank him for his generous hospitality. In the field I used Inskipp, but I also made some copies out of Rasmussen (eg larks, pipits and prinias) who were very helpful at times. All three available guides have their pros and cons. Grimmett, R., Inskipp C. & Inskipp T. 1999. 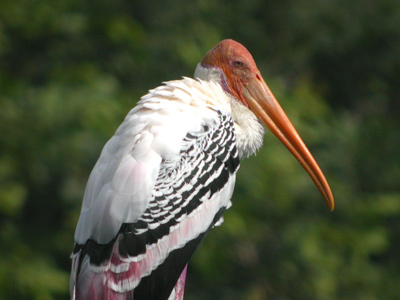 Pocket Guide to the Birds of the Indian Subcontinent. Christopher Helm, London. Kazmierczak K. & Sing R. 1998. A Birdwatcher’s Guide to India. Oxford University Press, New Dehli. Kazmierczak K. & van Perlo, B. 2000. A Field Guide to the Birds of the Indian Subcontinent. Yale University Press, New Haven and London. Rasmussen, P.C. & Anderton, J.C. 2005. Birds of South Asia. The Ripley Guide. Vols. 1 and 2. Smithsonian Institution and Lynx Editions, Washington, D.C. and Barcelona. This list follows Grimmet, Inskipp and Inskipp in order and names.